I don't know what it is about these simple (typically white or black), cotton t-shirts but I LOVE them. Perhaps its their funny slurs, their odes to famous designers or maybe its the idea that just about anybody can create these simple tees with a printing press and a warehouse shipment of AA cotton blends. 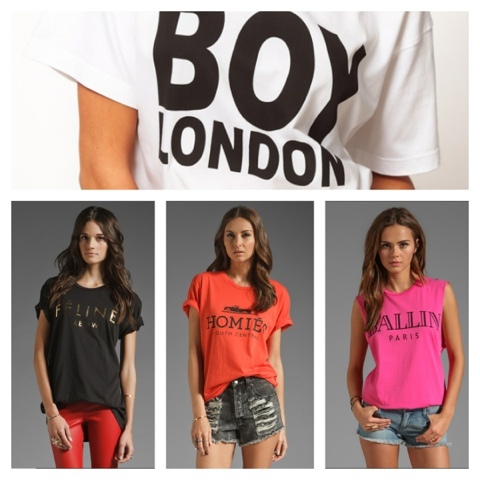 In my books, at the top of the "plain tee hierarchy" rests the ever popular and iconic flare of Boy London Ltd, but with new favorites, such as Made in Hell-A and Brian Lichtenberg. Above I have linked sites to purchase these tees but be warned -- they aren't cheap!